Not everyone can be a star. Brown dwarfs, for example, have failed at their attempt. These objects have masses below the necessary amount to reach pressure and temperature high enough to burn hydrogen into helium in their cores and thus earn the classification “star”. It’s not very long since we’ve learned of their existence. They were proposed in the 1960s by Dr. Shiv S. Kumar, but the first one was only observed many years later, in 1988 — and we are not even sure it is in fact a brown dwarf! We’ve only reached a substantial number of known brown dwarfs with the advent of infrared sky surveys, such as the Two Micron All Sky Survey (2MASS) and the Wide-field Infrared Survey Explorer (WISE). Discovering and characterising cold brown dwarfs in the solar neighbourhood is one of the primary science goals for WISE. There are two ways of doing that: 1) identifying objects with the colours of cold brown dwarfs; 2) identifying objects with significant proper motion. Brown dwarfs are relatively faint objects, so they need to be nearby to be detected. We can detect the movement of such nearby targets against background stars, which are so distant that they appear to be fixed on the sky. This movement is called proper motion. As the signal-to-noise ratio is not very good for such faint objects, the second method is the preferred one. However, single exposure WISE images are not deep enough to find most brown dwarfs. This is where today’s paper enters. The authors have launched a citizen science project called “Backyard Worlds: Planet 9” to search for high proper motion objects, including brown dwarfs and possible planets orbiting beyond Pluto, in the WISE co-add images. Co-add images are simply a sum of the single exposures images taking into account corrections to possible shifts between them. This increases signal-to-noise ratio and helps to detect faint targets. 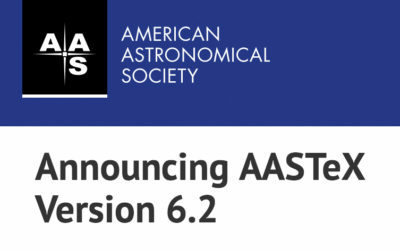 In today’s paper, the authors report the first new substellar discovery of their project: a brown dwarf in the solar neighbourhood, which was identified only six days after the project was launched! In “Backyard Worlds: Planet 9”, volunteers are asked to examine short animations composed of difference images constructed from time-resolved WISE co-adds. The difference images are obtained by subtracting the median of two subsequent images from the image to be analysed. This way, if an object does not significantly move, it will disappear from the analysed image with the subtraction, leaving only moving objects to be detected. The images are also divided into tiles small enough to be analysed on a laptop or cell phone screen. The classification task consists of viewing one animation, which is composed of four images, and identifying candidates for two types of moving objects: “movers” and “dipoles”. Movers are fast moving sources, that travel more than their apparent width over the course of WISE’s 4.5 year baseline. Dipoles are slower-moving sources that travel less than their apparent width, so that there will be a negative image right next to a positive image, since the subtraction of the object’s flux will only be partial. An online tutorial is provided to show how to identify such objects and distinguish them from artifacts such as partially subtracted stars or galaxies, and cosmic rays. Five users reported a dipole on a set of images, which can be seen here, the first report taking place only six days after the project was launched. The object, called WISEA 1101+5400, can be seen in Figure 1. This source would be undetectable in single exposure images, but in these co-adds it is visible and obviously moving. Follow-up spectra were obtained using the SpeX spectrograph on the 3-m NASA Infrared Telescope Facility (IRTF). The average spectrum is shown in Figure 2. 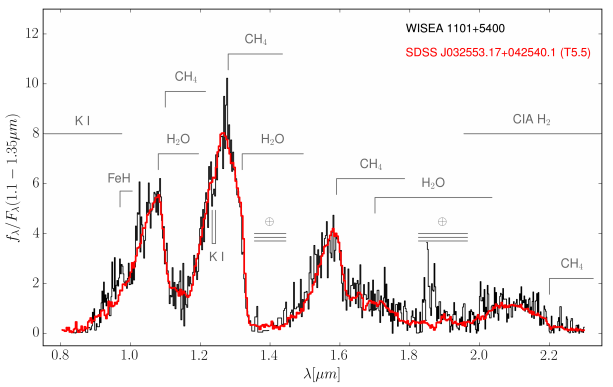 Both the object’s colours and the obtained spectra are consistent with a field T dwarf, a type of brown dwarf. Although the discovery of only one brown dwarf might not seem worthy of celebration, this discovery demonstrates the ability of citizen scientists to identify moving objects much fainter than the WISE single exposure limit. It is yet more proof that science could use the help of enthusiasts. So if you’re not doing anything now, why not head over to https://www.zooniverse.org/ and help a scientist? I am a third year PhD student at Universidade Federal do Rio Grande do Sul, in Brazil, and currently a visiting academic at the University of Warwick, UK. I study white dwarf stars and (try to) use what we learn about them to understand more about the structure and evolution of our Galaxy. When I am not sciencing, I like to binge-watch sci-fi and fantasy series, eat pizza, and drink beer.